The Thirty-Two Inch Ruler / Map Of Babylon. Steidl, 2010. 240 pp., 216 color illustrations in two volumes., 9¼x11¼". 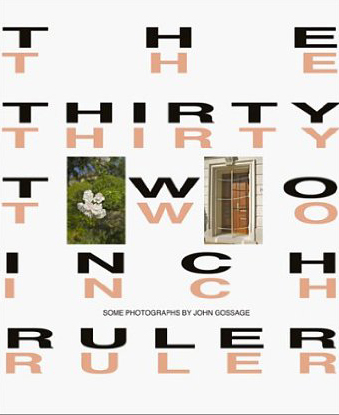 John Gossage, the renowned American photographer and photography book-maker, presents two companion volumes and his first ever books in color. Engaged in a dance, neither book comes first, there is no hierarchy or sequence to the pair of volumes. Please note, both volumes are bound together in one hardcover binding. 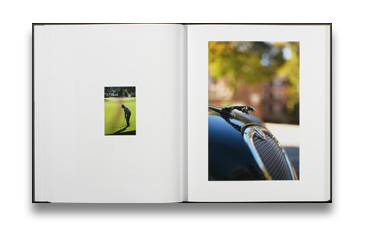 Gossage is one of the most literary of photographic book authors and in The Thirty-Two Inch Ruler, the narrative, whilst not autobiographical, is about a neighborhood in which he lives; one that is singular in the United States. At the same time provincial and international, it is a neighborhood populated by ambassadorial residences, embassies, and the lavish private homes of those who are in positions of power and influence in Washington. A project he began with the arrival of a new neighbor, the Secretary of Defense Donald Rumsfeld and made over a full year’s cycle of seasons, these are images from the drift of privilege. The streets, cars, homes and yards of this neighborhood are photographed on perfect spring or autumn days, with sparklingly clear blue skies, and flowers or foliage accenting the order. These are photographs about how one might wish the world to be, how beauty might be seen as desire. In the same year Gossage made the Map of Babylon, photographing digitally from Washington, to Germany, to China and places in-between. This look away, to places beyond the immediate and local, is a classic exploration of particulars of the outside world.